I have been playing with the Cuttlebug folders. This is only my second time playing with them so I thought I would keep it simple. A little up date 10 January 2010. It wasn't made for the any challenge other than making the card, it's just that it fits the bill so I thought I would give it a go. I have used a double embossed techneque on this card, which I found out how to do on YouTube. After watching the vid' I had to give it a go, and this it what I came up with. The butterfly I have stamped twice, punched one out in the oval then cut the other out, added some gems for the body then stuck it down with a thin line of glue on the stamped image. When dry I carefully folded out the wings to give a more 3D look. I have yet to add my greeting but as yet I don't know what I want on it. Here is a card that was got ready in a bit of a rush. It's a white on white card. I used white vellum embossed with a Fiskars plate, a jumbo snowflake that was covered in Glamour Dust glitter. on a white 6" X 6" card. This is the card that I intended to teach in the Thursday night class. But at the last Minute I changed my mind and instead I showed the ladies how to make a recess card. I kept to the same basic design. I didn't have time to change that. Talk about last minute preparations........ phew. Well at least the ladies went away happy with their makes. Here I have made a card using the Daisy punch. I made the flowers you see on the card the same way as the Paper Rose . The punches used where the largest Daisy and the medium sized Daisy. Using the same punches but change the colours and you would have a Sun Flower. I am really taken with this technique. Watch out for more flowers made this way using different punches. I have left the card blank because I couldn't think of a greeting to put on it at the time. Oh well one will come to me sooner or later. Here is a card that will bring some life to the punches that may be lying in your craft cupboard unused and unloved. I like making use of the punches that I have in my cupboard. And also like seeing what I can make with them. A Heart punch for the ears and a tiny heart punch for the nose. A Whale punch Swirl for the tail. These cards are fun to make. Right there is no excuse get out those punches and see what you can make with them. Teddies are a favorite on cards these days, all you need to make a teddies face is 2 sizes of circle a small one for the ears and a larger one for the face. Have a go and see what you can come up with. Here is a personalised card I made for a customer. I cut the letters out using my Pazzles. I cut each letter out in a different font and colour to add interest. I print the greeting and sentiment onto the card, making sure that the spacing for the name is just right. I do this by printing on to copy paper first and making any adjustments needed before I print my card. This is a celebration card so we have to have a glass of wine or a cocktail. This glass was just created from very thin strips of card bent into shape and glued down. Tiny gems where added for the bubbles. For this this card I used My Mind's Eye Wild Asparagus backing paper. I tore the paper and then coloured the torn edge with the same coloured chalk pad as the rose. The rose I made up of 3 sizes of Retro flower punched shapes . I punched the flowers out of water colour paper and coloured with a chalk stamp pad. I'll warn you, you will need lots of water to make this flower. Have fun! For those of you with the Pazzles Inspiration or the Funtime software, I have created a cutting file for the rose. You will find it in the side bar under "Usefull Stuff and free Cutting Files"
I made a sketch of a card design the other day. I have made a couple of Christmas cards using the sketch and I have also used the same colour Ice Blue. This first one I have used a Silver swirly Christmas tree peeloff. Backed it onto silver pearlesent card and cut around the peeloff. Decorated it with brightly coloured gems. I used a peeloff for the greeting. I have tied a bow with ice blue sheer ribbon and used an ice blue color core card stock to co-ordinate the rest of the card. The embelishment on the front of this card, is made in the same way as you make the rosette flowers but I have punched the card stock first with a Fiskars lace border punch before making it up. I finished off the rosette with a couple of punched snowflakes. I printed the greeting on the card this time with the printer. I realy like making these rosettes they are so much fun to do. Black and Silver is the colour scheme for this card. 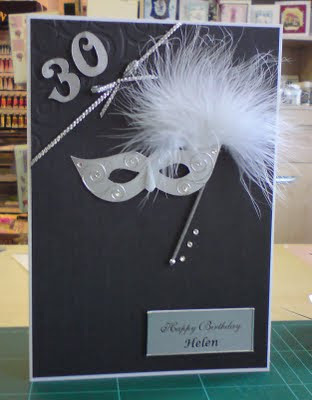 I was given a particular theme for today's card, it had to have a masquerade mask on it colours black and silver. The style was down to me. This is what I came up wit h.
I hope you can see it in the photo, I embossed the top left hand corner of the black cardstock with the Cuttlebug embossing folder. Because of the size of my card it wouldn't fit the machine so I used a rolling pin instead. It did the trick. I edged that with sparkly silver ribbon. The mask was drawn by myself in the Pazzles Inspiration software then cut on the Pazzles machine along with the number 30. I used silver peeloffs to create the pattern on the mask and a cocktail stick coloured silver for the handle with a silver bead on the end. I added a white feather and some gems to finish of the card. This is not my normal style and I must admit I was out of my comfort zone a bit. I did enjoy making it though. Hope you like it. This is my third post today. My my that's some catching up I have got done. This card was made for a wedding with a purple and black theme. I was asked to make a card for a Goth Wedding and this is what I came up with. Not being a Goth myself or had anything to to with Goths, I wasn't sure what to do. All I was given was a colour scheme. Feather pack also from the Venaissance range. I trimmed the feather with three black sticky back gems. The scalloped embossing is from my trusty Crafters Companion ultimate Pro trimmed with black 3mm ribbon top and bottom. This was a bit of a departure for me but I was pleased with the result. More importantly so was my customer, thank goodness. I was a bit nervous in case it wasn't what she wanted. Well that's all for today. I hope you like the cards I have shown you today. See you again soon with some more cards . I know it has been a while since I last posted some cards but as some of you know it has been a difficult time for me and the family lately. Any way I won't bore you with my problems any longer. Here are a few cards I have made but haven't got around to posting. I hope you like them. This first card was made for someone leaving to have a baby. The lettering was cut out from Nana's Nursery papers with my Pazzles Inspiration cutter. The embossing top and bottom of the card was created using Crafters companion ultimate Pro. then added three flat back buttons to finish off . Here are two baby cards I made a while ago for a customer. I made two cards for her to give her a choice of which she preferred and she took both. The card on the left is a simple card using a small punch to punch out the feet. I layered them up onto white card and then onto pink card. The wording was printed straight onto the card with a printer. This way I can completely personalise a card. The topper, on the pink card, on the right was made using the Fiskars border punch "Scalloped lace". I then printed of the wording for the card onto another piece of cardstock, trimmed it to size and the layered it on to the punched border. To finish off I used tiny pink fabric flowers and a piece of sheer ribbon. Thank you you for visiting my blog. I hope you like what you see here. After a long illness my mother passed away on the 18th September. The last few months have been a very sad and stressful time for all the family. I wish to say a big thank you to every one who has been so kind to me over the past few months. You have kept me going and have given me something to focus on. The shop has at times, been closed without notice but you all have understood the situation. So once again, Thank you from the bottom of my heart. I really do appreciate all your kindness.